With the explosive growth of images and videos on the Web, there is an urgent need of techniques for efficient analyzing and indexing multimedia contents. In this context, visual concept detection, aiming at automatically determining the appearance of semantic categories, has attracted intensive attentions in past decade. Specifically, we investigate three correlated research issues of this problem:(1) the acquisition of sufficient training examples which are essential for effective learning of semantic concepts, (2) the generalization of the learnt models to unseen datasets with potential domain shifts, and (3) the improvement of speed for concept detection in large multimedia datasets. Rich information gathered from Web user social behaviors has reformed the way of organizing, browsing and searching multimedia data. Despite the challenges on processing the large-scale data coming up with proliferation of social sharing websites, the various social activities further provide an opportunity to design more robust systems which can improve the performance of several traditional applications with the help of social information. In this context, we focus on social analysis of heterogeneous entities and their relationships on social Website. 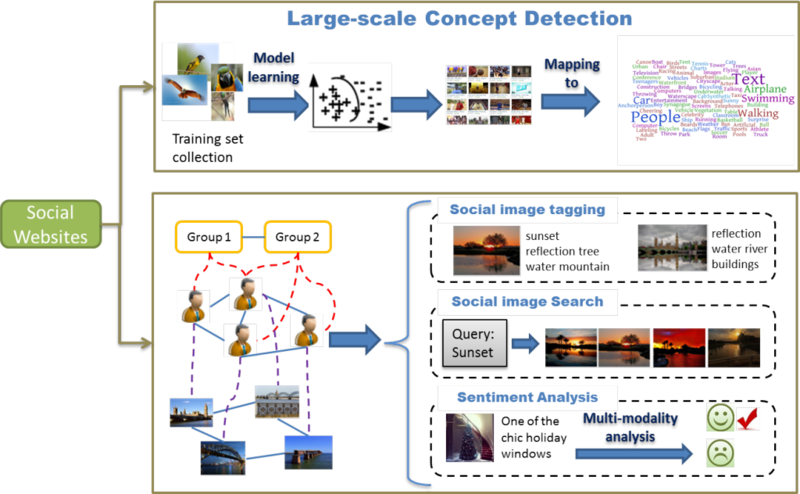 The current projects include image tagging and search with social clues, multi-modality sentiment analysis of Twitter messages, and social image geo-location prediction.